"Like" token, awarded by 616. "Like" token, awarded by perkinsjs83. "Like" token, awarded by Snuggle. I don't think this has sufficient information for the "value-add" of this package, so I'll just add it to here. ? 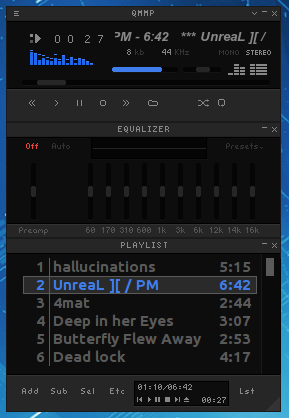 Qmmp is a simple, minimal and lightweight music player based on Qt that has one job and does it perfectly. It includes a music equalizer, playlists, visualizers, shuffle, repeat etc all within one tiny little application that you can just leave in the corner of your display. Each section [Music/Equalizer/Playlists] is completely modular and can be moved around independently or closed. This has all the features you could want from a local-file music player within a really tiny & easy-to-understand window. Snuggle changed the task status from Open to In Progress. I'll try my hand at packaging this. ? As this task has been marked Needs Maintainer for over a month with nobody having stepped up to become maintainer, in addition to providing an acceptable patch for inclusion, marking as WONTFIX. Feel free to re-open when a patch has been submitted via the proper processes.